How do you choose the correct type of video for your business? By now you know - as a business, if you don't have video content as a major player in your marketing strategy, you're falling behind. So, you know you need a video. But that leads to the question, what type of video do I need for my business? Not everyone feels comfortable sitting down in front of the camera for a testimonial, they don't quite understand the point of an animated explainer, they're not aware of other video types, and they definitely don't know which options are best per their needs. We've created this flowchart for you to follow along, ask yourselves the questions, and ultimately, lead you to the answer - what video type(s) do you need? And is the need ongoing, or singular? It helps us strategize and formulate the best video and visual content plan for you and your business! Some common video types that we've covered include animations, product demos, testimonials, social media GIFs, safety videos, tutorials and more. But even more important than the video type, we've also covered the questions that you must ask yourself in order to reach the ultimate goal - determining what is the best approach to video and visual content creation with Pop Video that you need for a successful strategy. We can connect on both a project and partnership level for video, but it truly depends on your needs and goals as a business. To determine the best approach, first, you must define that strategy through asking questions such as: what is the goal, who is the target, and do you have a general idea for a video? Second, comes the concept development. This stage includes questions such as: will one video be effective, what is the need for content, how often do you require content, and more. 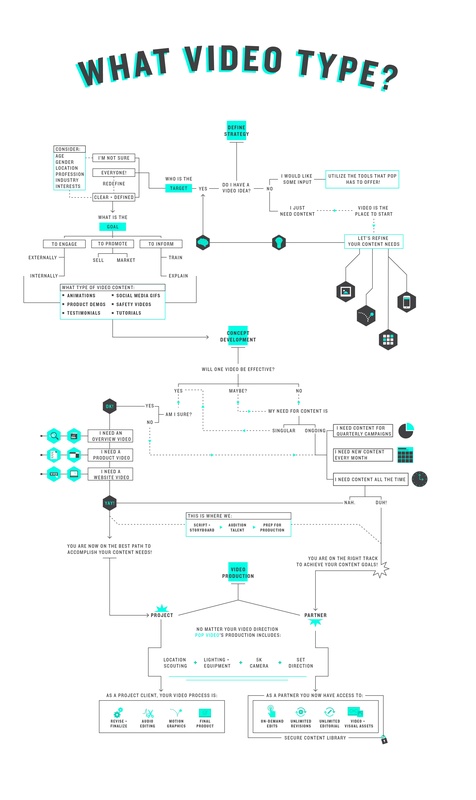 Then, the final stage in this flowchart includes the video production aspect. This is the section in which we flourish! As a video and visual content partner, Pop Video can provide unlimited editorial for your business through our partnership approach to video content creation. This flowchart helps define your need - project or partnership. We can excel under both approaches, but it's truly dependent upon what your business' marketing and overall content goals include. To learn more about why Pop Video is THE video content solution for businesses, check out Why Pop page.